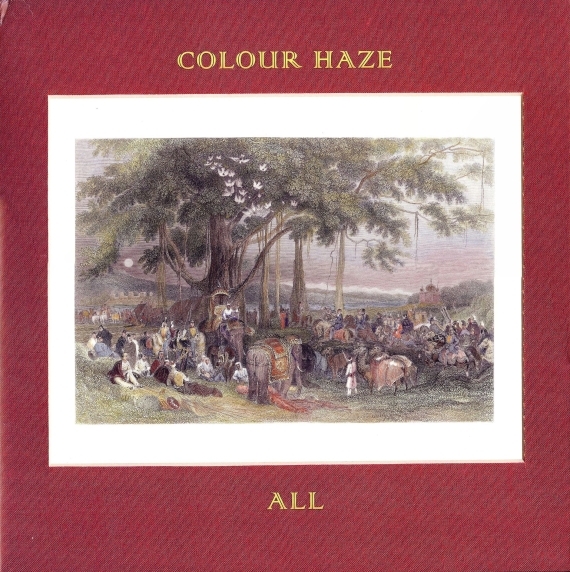 Colour Haze is a German band that is new to me, though they have been recording since 1995. You can pretty much trust any Elektrohasch release to be great, and All, Colour Haze’s seventh release, is no exception. Some of the songs are remarkably casual in their approach, and yet there is a driving beat, fuzzed guitars, catchy riffs, and soulful vocals with a 60s psychedelic feel. There are definite touch points to Jimi Hendrix, but more with tonality than the guitar solos. The second track “Moon” made me think of “Wait Until Tomorrow,” the third track “Turns” called to mind “Are You Experienced?” and “Voodoo Child,” and the instrumental “Lights” with its trippy guitar-bass-drum-organ jamming is akin to “1983” and “Third Stone from the Sun.” Though there are Hendrix elements, the music definitely belongs to Colour Haze. In contrast we have the quiet acoustic psych “Stars” with its fantastic sitar and guitar duo. All this music leads up to the 15-minute title track that could have been on the Zabriskie Point soundtrack. The music slowly builds for the first seven minutes with some very cool guitar riffing that rivals Jerry Garcia’s “Dark Star” ultimately kicking into gear for an all out jamfest. The mixture of acoustic ballads, free jazz bass lines, and heavy guitar riffs demand you to explore the disc’s ten instrumentals and songs. Just spin this disc; the music will take you away on an enjoyable musical journey that is over far too soon.